Member Benefits - National Independent Concessionaires Association, Inc. The discount and savings programs that NICA has negotiated with our premiere partners are just another way we are building relationships throughout this industry in order to bring much needed and REAL benefits to our members. See the 2019 Benefits Booklet for more details. NICA has negotiated with Coca-Cola to provide NICA Members with special national account pricing on a variety of products including dispensed sparkling and still bag-in-box beverages. Every food vendor is eligible to sign up when they join NICA, and their account will be renewed annually with their membership. These accounts are set up by Coca-Cola for national account pricing and may take 4-6 weeks to activate. NICA and Pepsi have joined forces to bring special pricing on their beverage products to all NICA Members. Every food vendor is eligible to sign up after joining NICA with the online or paper National Account Program application, and their account will be renewed each year with their membership. The application, along with a W-9, must be submitted online, emailed, or faxed to Pepsi to sign up. This process may take from 4-6 weeks to activate your account. Once activated, members are eligible for the Pepsi rebate program. OCC Signs has you covered with special discount pricing for all NICA Members. Products include graphics and wraps, banners and fence panels, custom branding and design, menus aand shape cut signs, product photos, stickers, full-color prints, backlit signs, register covers, displays, design, and more! You can call (714) 447-4484 or visit www.occsigns.com and let them know you are a NICA Member to receive your free estimate and speical discount pricing. Participating in the NICA Sysco Marketplace is free to NICA members. As a NICA member you are part of this nationwide buying group that translates to over 6,000 items at lower prices at any Sysco Operating House in the country. This program pays quarterly rebates for purchases directly to your company. To participate in the agreement savings enroll by visiting nica.source1purchasing.com (Let's enroll) or call 855-888-6422. Because many concessionaires use a variety of products and specialty products, please contact your Sysco Sales Representative 1 – 2 months before you need the product delivered. Click here to see an introduction video for this program. Rent your car today with special pricing for NICA Members. Your BCD# is on the back of your membership card. Go online and sign up at www.budget.com today! Special low rates and discounts on car rentals. Save up to 20% on Hertz Business Travel Rates at airport and off-airport locations. Special rates are also available at Hertz Location Edition® locations. Complimentary membership in Hertz #1 Club Gold® (a $60 annual value). Earn FREE Rental Day Certificates with each qualifying rental. No additional driver fees when other employees drive the rental vehicle. Active accounts receive quarterly statements & additional value-added offers and savings. At off-airport locations across the U.S. and Canada, receive great discounted rates with the same great service you receive at our airport locations ® Hertz offers a variety of billing systems. Go to http://bapgold.hertz.comPlease call the office for the Pin Code. Crystal Automotive is located in Homosassa, Florida and specializes in Dodge vehicles. In addition to Dodge vehicles, they offer Chrysler, Jeep, Nissan, and Chevrolet. All NICA Members will receive "Crystal Family and Friends Discount Pricing (Below dealer's invoice) as well as free shipping anywhere in the continental United States." To receive your discount, please contact Greg Worth, Fleet Manager, at (352) 634-4582, by email at gworth@crystalautos.com or by visiting Crystal Automotive's physical location at 1035 S. Suncoast Blvd., Homosassa, FL 34448. Additionally, you may visit their website at www.crystalautos.com for more information. Ford Fleet is available at any Ford Dealership. To receive the fleet discount you must call the NICA office to get the Fleet ID# and account name. The dealership will ask for this information and a current NICA membership card; be sure to have the membership card with you. NICA members can save a GUARANTEED 20% to 40% off their hotel lodging with CLC Lodging's CheckINN Direct hotel savings program. There are more than 10,000 hotels coast to coast that accept the CLC Card. Enrollment is FREE for all NICA members. The only cost is a $4.95/per night fee, which is usually a small fraction of what you can save! Call the NICA office for the NICA key code and sign up at http://www.clclodging.com/nica or call 866-226-1544. Pro Insurance offers broad, competitively priced programs for health insurance, short term medical, international travel medical, term medical, student medical, term life, dental and vision, disability income and long term care. As a broker, PRO works for you and when you visit them online for free immediate rate quotes, you will find they encourage insurance companies to compete for your business. Visit www.pro4.us/nica.asp or contact them toll free at 877-CALL-PRO or 800-821-7383. Tell them you are a NICA member and have your membership number ready. 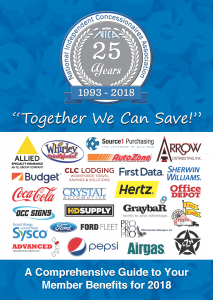 This amazing discount program on RV parts and accessories is made available to NICA members through Arrow Distributing. Contact the NICA office to get the toll free number for Arrow Distributing and a purchase order number. As with all of our national discount pricing programs, you will be responsible for payment of your orders. AutoZone is the nation's largest after-market auto parts provider, with nearly 4,200 company-owned locations and over $6.3 billion in sales. Through the country's largest cooperative buying program for local government, AutoZone was awarded a national contract to help support cities, counties, educational institutions, state agencies, and non-profit organizations. Through this contract, NICA is eligible to benefit from the national pricing and services offered by AutoZone. It is important to tell the attendant in the store that this is a commercial account so they can apply your discount, which often takes off a percentage as well as tax depending on the item. Find an Autozone Near You! HD Supply handles the same types of products that you would find at Home Depot and much, much more. With 42 distribution centers across the country they will service 95% of the country with next day delivery and orders over $50 are shipped for free. First, call the NICA office for the discount code and some supplementary information; then log on to their website at www.hdsupplysolutions.com. Once online, set up your COD or credit card account and you are all set to go. This is a discount program that allows you to buy at government pricing. Sherwin-Williams provides the following discount program: 30% off National Account Pricing on all paint and 30% off list price on all sundry items such as brushes, rollers and drop cloths, etc. This discount is only available at Sherwin-Williams stores; check with your local store to see if any of their products do not qualify. You will need to provide the store attendant with your NICA membership card and the program account number. Find Your Nearest Sherwin-Williams Now! If you have any questions concerning these benefits or have experienced changes in stated programs, please call the office at (813) 438-8926 or email nica@nicainc.org.